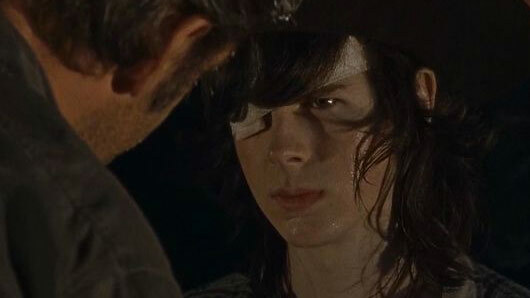 Walking Dead fans were horrified last month when rumours began to circulate that Chandler Riggs, who plays Carl Grimes on the show, was leaving the zombie franchise. The rumours began when Riggs’ father posted the following message on his personal Facebook account, writing: “7 year contract completed! Grateful to AMC, Cast & Crew, TWD fan base and especially Chandler for always being 100% dedicated. Fans unearthed the message and concluded that Riggs might not extend the contract that has seen him play the son of Rick Grimes since he was a pre-teen. The news seemed to tie in with reports that Riggs would be attending Auburn University in Alabama from the start of the next school year. However, Chandler has finally spoken out to put fans’ worries at risk in a new interview with the Hollywood Reporter. Asked how his acceptance to university would affect his work on The Walking Dead, Riggs said: “You never know how it will go. I really do hope it works out because that would be really cool. It’s worth noting that Riggs’ new university is within commuting distance from the filming set of The Walking Dead, so theoretically, he would be able to attend both.